Piwigo is a photo gallery web cms. It is free and open-source. You can built a photo gallery site with wide set of features using this platform. Embedding Jotform to Piwigo is pretty easy. To do that, please follow these very short steps. 1. Install "Additional Pages" plugin to your Piwigo site so you can add pages and embed your form. d. Find and install "Additional Pages" plugin. e. Activate the Plugin by going to Manage Plugins again. 2. 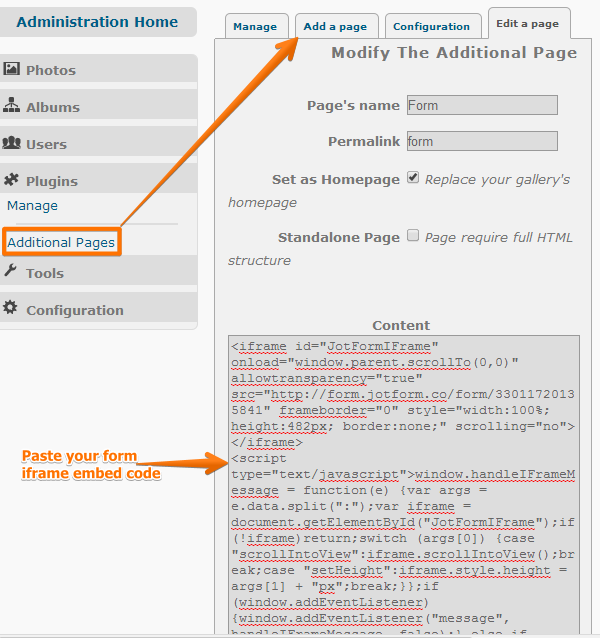 Create a new page and paste your form iframe embed code. 3. Save the page and check your form. That's it. If you have questions about this guide, feel free to post a comment below.